“The heart is like a garden. It can grow compassion or fear, resentment or love. What seeds will you grow there?” – The Buddha. I took a week off blogging last week, as I have been reflecting on the loss of Chatral Rinpoche. As the western world is busy mourning David Bowie, truth be said I personnaly felt very sad and a lot more affected by the loss of Chatral Rinpoche, who died at age 102, on the 30th of December. 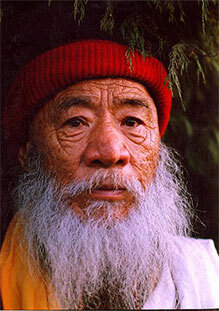 Chatral Rinpoche spent about a total of 40 years meditating in remote caves in Tibet. He has shunned fame, institutional and political involvement his whole life, choosing instead to live the life of a wandering yogi. He has saved the lives of thousands of animals in India and set up many retreat centres. The world has lost one of the most highly realised yogis of our time and hardly anyone mentioned it, online or elsewhere. He has inspired me for many years. Although I have never met him in person, I have always felt the thought of his presence – and the fact that he walks on the same earth as me – comforting. It felt reassuring to know that he was there somewhere, praying for the rest of us, meditating, saving animals and dedicating his entire being to make the world a better, kinder, warmer place. Back in my Animal Rights activist days, I always felt that in my very humble and ignorant way, I was trying to walk in his rather huge footsteps, by trying to walk his talk and live up to his message. Even though I was not doing that much in the grand scheme of things. Just causing trouble, making noise… a mere drop in the ocean, really. I probably should have followed his footsteps a little further and spent more time on my meditation cushion back then (and now! ), instead of rushing around so much! He was renowned for his strict discipline, his integrity and the fact that he dedicated his entire life to his spiritual practice for the benefit of others, without becoming a monk or pledging allegiance to any particular monastery. “The passing of Chatral Sangye Rinpoche marks the end of an era. Suddenly we have lost a sentry who was zealously guarding the Buddhadharma in general, the Vajrayana in particular, and especially Tibetan Buddhism and the Nyingma lineage. 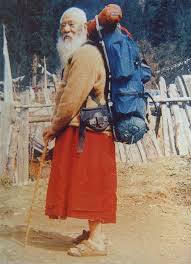 The word chatral has the connotation of an ascetic yogi who abandons all. Usually names are given as labels. But in the one now passing into paranirvana, the name Chatral was not just a label. He was the epitome and embodiment of what the word chatral really means. 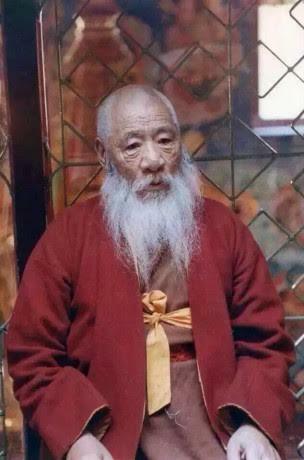 In his long lifespan of more than 102 years, this is a man who did so much, associated with some of the greatest beings, and became master of the masters, including teaching and becoming the guru of the very man who found the 14th Dalai Lama Tenzin Gyatso, who was known as Yongzin Gyaltsab Radreng Rinpoche. Yet this same man can barely boast a monastery, institute, or dharma centre. Around him, paraphernalia like gold-plated roofs and thrones are nowhere to be found. He was a Chatralin the true sense. But make no mistake: Many lamas like myself, who make the loudest noises, display the most jarring images, and travel every inch and corner of the world, have achieved next to nothing compared to this man who appears never to have done anything except for keeping his meditation mat from ever getting cold. And if he did manifest in action, this is the man who spent 99.99% of what he had rescuing the lives of animals. So for ignorant beings like us to try and express the great qualities of this enlightened being is like trying to measure the depth and width of the sky. And yet if I may express one thing from the little I have known of this man it is this: The Buddhadharma has so many challenges, including all the charlatans who do outright damage to the image of the Dharma. These may be overcome by those who seem to do the right thing, who appear serene, proper, and moral, and who never upset anyone. But that often leads us into another challenge that is harder to overcome. Because in doing things correctly, properly and morally, and in bearing the burden of not upsetting people, one ends up being the victim of political correctness and becoming hypocritical. Back when vegetarianism was a very taboo and uncomfortable subject amongst buddhist practitioners around the world, Chatral was always very clear on this. There was indeed no room for hypocrisy, excuses or convenience. Beyond the animal kingdom who has lost a great spiritual ally and a very dedicated friend, the world has gone colder, as we, humans, have lost a light. A light that was brightly shining in the darkness, for us to find our way in the maze of existence. So this amazing man lived on this earth for 102 years, and I just found out about it him now! !